A hammer is all any Beninese child needs to join the 200 chipping away at blocks of stones for hours on end in this village -- work declared harmful to health by a world convention on child labour that Benin has signed. Across the poor nations of Sub-Saharan Africa, some 48 million children aged under 14 work for a living, according to the International Labour Organisation (ILO). That is almost one in three. Hammering down stone into gravel for sale to the construction industry, which is hard and hazardous work, is a common occupation for children in Benin as well as in neighbouring Nigeria. This vast quarry just outside the village of Tchatchegou, 250 km north of the capital Cotonou, stretches for several square kilometres, with mounds of gravel as far as the eye can see. Behind piles of pebbles, in the shade of trees and makeshift shelters, women and children of all ages are busy working, some crushing stones, some sifting sand, some hauling pebbles in plastic basins to stack up the mounds. Sitting on a stone, like everybody else does, 17-year-old student Maxime told IRIN that he regularly works crushing stones in the quarry. Crushing stones was about the only good work going in the area, he said, where the soils have become too poor to produce much. Like many of the children working there, Maxime said it was thanks to the quarry, where he started working as a small child, that he was putting himself through school. “Sometimes I earn up to 1,500 CFA francs (US $3) that I use to pay school costs and to help my parents,” he said. Nearby an eight-year-old girl, hunched over with the effort of trying to break a stone, said she worked with her mother. “We come every day from Okemere (5 km away) to work here,” Anna said. 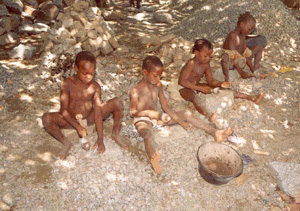 [Benin] Beninese children crushing stones into gravel at a quarry at Tchatchegou, north of the capital Cotonou, June 2005. The women and children told IRIN that they bought big stones for crushing for an average 5,000 CFA francs (US $10) each from men who use dynamite to blast rock, that is located a few kilometres away. Josephine Oketokoun, a 40-year-old stone crusher, said the women then haul the stones themselves to the site, where they work with the youngsters. School children work only at weekends or after class, crushing stones into gravel that is then used to construct roads and buildings. But those children not enrolled in school can work more than eight hours a day, six or even seven days a week. Between 150 and 200 children labour at the quarry, Otchoun said. According to the ILO, more than a million children are employed worldwide in such small mines and quarries, working in conditions denounced by the ILO Worst Forms of Child Labour Convention of 1999. At Tchatchegou, the scars and running sores on children’s limbs are testament to the physical risks involved. The children cover up with bits of old tyres or pieces of cloth to protect themselves from being injured by flying shards of stone. But accidents happen regularly, said Otchoun, mostly from stray shards or clumsy misdirected blows with the hammer. But Benin is one of the world’s 20 poorest countries, so working long hours for a pittance and taking risks is better than not working at all. A third of Benin’s 7.5 million people live below the poverty line, according to the United Nations Human Development Index, and population growth continues to exceed economic growth. Local schoolteacher Marc Tchanou said that in spite of the hazards, people living in the area had few options other than the quarry to eke out a living. “But as long as the work’s available, it’ll be hard to prevent child labour in the quarry, especially given that most of them work alongside their parents,” he told IRIN. The government meanwhile has drafted legislation to ban child labour but the bill has not yet been adopted. 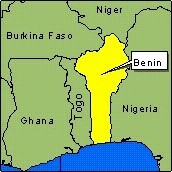 Tchatchegou is far from being Benin’s only example of child labour in small mines and quarries. Children work in other stone quarries across the country as well as in gold mines and clay works. “There’s more and more of this sort of work,” said Raouf Pereira, a Beninese doctor specialising in occupational medicine. The long hours and heavy loads were detrimental to a child’s motor development, he said, and there was a continual danger of injury from flying chips of stone or from rock falls. Potentially life-threatening respiratory illnesses were common among children who worked in mines and quarries where they inhaled dust in the dry season and too much damp during the rainy months. Crushing granite was probably the most dangerous of all such jobs, he said, because granite dust contains silica crystals that can cause a lung-destroying disease for which there exists no treatment to date.